Academy of Design, founded in 1988 by George & Christine Greatorex. They provide kitchen and bedroom products in Mold and to the surrounding areas; Vale of Clwyd, Wirral & Chester. The local council will not allow the 18c windows on the AoD property to be changed or double glazed. As a result the windows have aged badly and cause a draft. So the bosses at AoD loved the idea of shutters to hide it’s shabbiness and the view of the side of the house opposite; equally, adding winter insulation was very appealing. Angela Eardley of Just Shutters NE Wales, Wirral and Chester has worked for the Academy of Design and it’s owner George for 20 years. George is very keen to support Angela and her husband Ken in any way he can. Seeing the mutual benefit, he was very quick to suggest using the old window to put a shutter display. The partnership is excellent for both parties; we can invite people in to the shop, to see the shutters in situ and also any extra people coming in to see the shutters might even decide they fancy a new kitchen!! 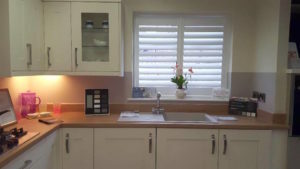 “I would so definitely recommend Just Shutters to any prospective client. I would also be delighted to provide any further information that may be required.” He also added. 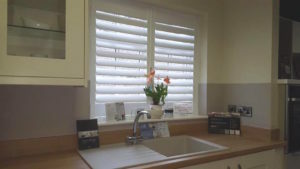 If you would like to discuss the wonderful benefits of shutters; either for your home, or business, or if you would like to discuss Just Shutters partnership opportunities please call us on 0845 894 0700.